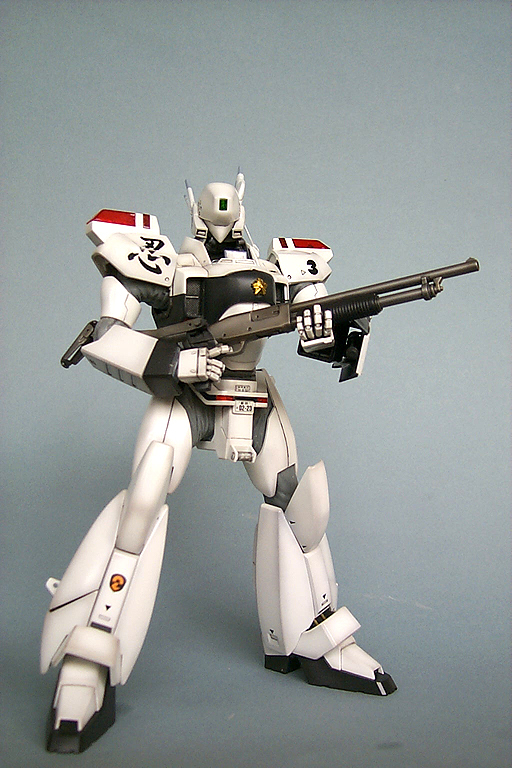 Patlabor is one of my favorite show – the realistic settings, memorable characters and very intriguing plots. Ingram is the star mecha (or “labor”) of the show and is used by the police force. There’s Ingram 1 used by spunky Noa, No. 2 used by hothead Ohta, and No.3 usually takes a backseat and doesn’t often appear. In the show, it’s often used for spare parts. Memorable appearences includes the final fight with Griffon (piloted by Kanuka) and in Movie 2 (piloted by Shinobu, with a different head). The design of Ingram 3 is supposedly for electronic jamming, but I like it because it just looks really cool. After more than a decade, Bandai finally comes up with a nice rendition of the Ingrams. They are very nice proportion-wise, and looks really cool out-of-the-box. Unfortunately Bandai made a few wrong choices IMO and really reduced the joy factor derivable from the kit. Just want to emphasize that despite my bitching, this is still a very good kit if you’re willing to spend time with it.To simulate the clothed joints Bandai used the rubber covers like the 1/60 kits, of course reformulated so that they don’t melt the joints inside. The joints are mostly made of ABS plastic, which are very durable and makes the joints very sturdy. However, this also makes some of the joints too tight, even if you didn’t tighten the screws a lot (and don’t do it!) The worst joint is the elbow, it’s a ABS plastic plug-and-socket type which allows twisting of the lower arm, however the ABS almost immoblize this joint. Don’t try too hard to twist or you’ll end up breaking the elbow (which isn’t very strong). I recommend using some vaseline on the plug part. I’m also unhappy about the lack of double joint here – that’s really sloppy. On the other hand, the rubber cover cannot extend enough to hide the internals when you bend the arms more than 90 degrees, so that’s probably why they did it this way.The second problem is of course the rubber clothing themselves, which has disgusting parting seams running through everyone of them. They’re really noticable – if you look at the sample build up, the builder trimmed them down but still it’s very obvious. To remove them, I used a soldering iron to melt the seam away. Use low wattage and be careful not to melt too much away. I spent nearly two hours just dealing with these parts. You can probably paint them with paints that are suitable for vinyl surfaces, but other non-flexible modeling paints will crack unless you don’t move the joints. Finally the fists are STUPID. Who makes these fists-with-a-hole type these days? They look like toys and really represents a step backward for Bandai. I filled them with polyester putty and resculpted the fingers. Don’t be a sucker and buy their upgrade hands for Ingram! That’s a real rip-off. Especially when the open hands in this kit are pretty well-done. Note that the shotgun is not included. Ingram 2 includes the shotgun (I think they call it riot gun), but it looks like two toothpicks glued to each other and I dislike them immensely. I made a few small modifications to the kit. The pilot Shinobu Nagumo is sitting on an open chair, but if you watch the show the seat has a safety lock to protect the pilot, so I added that. The antennae on the left shoulder are too thick compared with the line art, so I replaced them with thinner brass wires. As mentioned above, I resculpted the hands a little bit. The movable hand (typical ball-jointed-thumb type) is really loose and is useless to hold anything but the revolver, so I carefully bent the open palm into a gun holding shape. These hands are made with malleable plastics which I always like, and you can use a flat-nose plier to bend the fingers in shape. The riot gun is modified from one of Dragon Toy’s shotgun – the designer must have looked at modern shotguns when he designed the riot gun, the one shown here is *almost* a duplicate, except the shorter lower barrel and the two barrels are linked together around the root (I thought it was a Dragon’s misfeature, but it turns out the real one looks like that too). It’s even got the folding stock! Finally a minor shortcoming of the kit is the lack of detail, especially in the ankle areas where the hydraulics are. In the days of Perfect Grade kits, the bareness here is not forgivable! So I added some pistol and pipes. On the plus side, the ankle has an incredible range of movement.